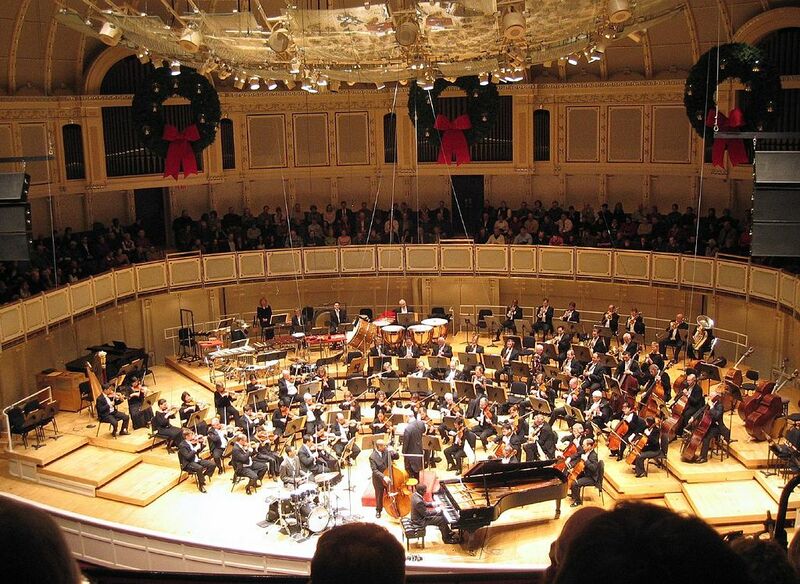 On March 10, after months of bargaining, the contract for the musicians of the Chicago Symphony Orchestra expired. Picket lines aren’t usually associated with some of the world’s most elite musicians, but the CSO members of the American Federation of Musicians Local 10-208 decided to strike. The symphony orchestra members are now a fixture outside the Symphony Center in the heart of downtown Chicago. Isaac Silver interviewed three striking musicians, who represent the wide generational range within the CSO, about the strike and their thoughts on the intersection of classical music and the labor movement. John Bruce Yeh has played clarinet for forty-two years in the CSO and is Assistant Principal Clarinet and Solo E-flat Clarinet. He was the Acting Principal Clarinet from 2008 to 2011 for the CSO. Youming Chen plays viola in the CSO, which she joined in 2015. Clara Takarabe also plays viola and has been a regular substitute for twenty years. How did you decide on becoming a professional symphony orchestra musician as a career? I have loved music ever since I was a child, although I planned on a scientific career to follow in my parents’ footsteps. Halfway through a pre-medical program at UCLA, after having attended the Aspen Music Festival, I decided to transfer to Juilliard and study clarinet and orchestral music. Sir Georg Solti offered me a job with the Chicago Symphony, so I decided to drop out of Juilliard in 1977 and take it, because it was a once-in-a-lifetime opportunity. I play viola in CSO. It is an instrument that produces the frequency range closest to the human voice range. Viola sound is not as noticeable as violin, flute, or trumpet, but it fills the sound between melodic line and bass line. Without its sound, music will seem hollow. My orchestra career came to me because of family. I was a doctoral student, nearly done with course work, when my wife and I found out we were having twins. I freaked out, and asked myself: how would I afford feeding two kids at the same time?! Two college tuitions?! I chose auditioning for the orchestra as the quickest way to stability. Knowing what I already know about music, it seemed the most logical choice. However, I knew that the audition process is arduously difficult. Nevertheless, I did it, with much help from friends and teachers. Most people imagine many hours of practicing, but audition preparation also requires inconceivable amount of thinking, theorizing, and visualizing about the audition day. I also play viola and my position is substitute viola in the Chicago Symphony Orchestra. I started my musical education young and knew I was a musician from early on. Whether I would pursue that professionally was not clear to me at all, since I had strong interests in other fields. I do have a strong belief that all human beings are born as natural and profound expressive beings, so I believed that being a skilled and sophisticated musician was a human trait, even though I know it takes a great deal of human capital in order to get to a particular skill level in classical music. I was born in Los Angeles. It was a rich musical environment, given how many Soviet emigres lived and worked there. Like John Bruce Yeh, I also went to UCLA and studied sociology and philosophy. I later moved to Chicago to study Classics, studying ancient philosophy, political philosophy and economy, ancient war and governance at the University of Chicago. When I was in my last year of my undergraduate studies, I had no idea what I was going to do in the future and I was asked to play at the Stradivari Society. There were several members of the Chicago Symphony present, and they encouraged me to take the substitute audition the next year. I did, and I won. What is your work week like as a professional musician? We each practice individually at home to perfect the repertoire we are to play in the orchestra and hone our skills on our instruments. Then we all get together and rehearse three or four times a week for 2.5 hours each rehearsal. Then we usually have four concerts per week of a particular program. The pressure to perform at this level is grueling. But the rewards are satisfying. This routine goes on for about thirty-five weeks for our “downtown” season, with a few tours interspersed. Then we play at the Ravinia Festival [in the suburbs] for six weeks in the summer. While that may seem short to the general public, these are hours [during which] one hundred people do the same thing together, hence the term “symphony” — synchronized sound. During this time, only the most concentrated work happens. Of course, [there is also] all of the individual practice at home, or on the road, listening to music, or thinking about how a musician produces the sound, how to fit in with the others. Concerts are only the tip of the iceberg. There is a mass of ice below the water line. Many of us have chronic pains from playing our instruments in the same positions. (One can’t just stretch or get up for breaks). CSO also has unique programming. We seldom do “pop” or “family” concerts as other orchestras do. These pop and family concerts provide some relief for musicians, as the music may not be as difficult or strenuous to put together. I think the professions that might have similarities to the professional musical life are a combination of how lawyers prepare their cases, athletes who prepare their bodies, and surgeons who execute intricate fine-motor actions. Most of the work happens before we get on stage. There is much prep work to do: maintaining the fine motor skills, self-observation, and practice. We are like athletes in the sense that playing an instrument is a whole body endeavor. We do labor with our bodies in a profoundly concrete way. Many musicians end up injured and in quite a lot of pain, even with the best technique and form. It is physically exhausting and taxing to play an instrument. Those observing us tend to be observing us in their leisure time, so they project that we as musicians are experiencing leisure when the audience members are enjoying the work that we do. When we are making music, we are laboring and working quite hard. What are the major issues that led to this strike? How do the issues being bargained over impact you? The major issue that we are striking over is the demand our management is making to discontinue our defined benefit pension and replace it with a defined-contribution savings plan. Our pension benefit, which we have been guaranteed for the past fifty years, is a major cornerstone of our strength as a leading symphony orchestra. Any attempt to take it away is an egregious affront to our quality of life. We have also in recent years fallen behind some peer orchestras in salary, and our management refuses to grant us parity. These two demands are signs that our management disrespects the high quality of the work we do. I played in a couple orchestras before coming to CSO, neither one with a retirement benefit. Before CSO, I was also teaching private students, coaching chamber music to high school music students. On top of this, I was also preparing for my CSO audition. Three things at once! Each is a job on its own, but my family and I plowed through it, knowing perhaps landing a job at CSO would lighten our crazy schedule to make a living. My wife also taught music lessons. We simply want a life and to spend time with our kids. The major issue is the defined benefit pension plan. However, as a substitute, I have seen my own pay and vacation pay on the bargaining table, which I find very frightening. Chicago Symphony is well known for their substitute pay as being the same as base pay. Most orchestras in the United States, substitutes get paid much less than base pay. Substitutes play at the same level as their tenured colleagues, so we earn our pay. There has been ample talk about having a two-tiered pay scale, which is divisive and philosophically problematic in my opinion. I’ve heard that the strike vote was essentially unanimous, spanning many generations of musicians. What kinds of conversations did the members have in the lead-up to the strike vote? We have tremendous solidarity in our membership. The conversations have been simple and direct. Our union negotiating team cannot recommend that we accept the current offer made to us by the management. We have given our negotiating team authorization to withhold our services until they can bring us an agreement they can recommend to the whole group. Before the strike vote, we had a media blackout agreement with the association [CSO management]. Lifting the media blackout agreement was the first step, because we wanted to tell the public in our own words what we are fighting for. Voting to strike was not taken lightly by any of us. But the association’s unyielding negotiation with our musicians’ committee made many feel a strike was a necessary course of action before contract termination. One thing that makes this strike significant in the music world is the prestige of the CSO, considered one of the best in the world. How does your union contract impact other musicians and performers in Chicago and around the country? We are and always have been leaders in our profession, both artistically and with respect to negotiating contracts. Every other American orchestra is watching us and is counting on us to lead the way to establish fair wages and conditions in our field. As Maestro Riccardo Muti said, the whole music world is listening to what is happening to Chicago. We were at the top of orchestra contracts. We have started to slip from many categories in the contract. My colleagues in Pittsburgh who graciously invited me to play with them this week, the first week of the strike, are watching intently. So are other orchestras around the world. A great collective bargaining agreement (CBA) in one orchestra can influence how other orchestras committees think and imagine their work life to be. Every detail of how to live one’s laboring life affects the quality of life in general. As an orchestral musician who has played in Chicago Symphony, Los Angeles Philharmonic, Minnesota Orchestra, and Dallas Symphony, I see how the CBAs differ, how time and money is allocated differently, and how that impacts the quality of life and music making in each city. I also see where unions are stronger or weaker and how protected or exposed musicians feel according to the strength of the union or if the union is in a right-to-work state. This is now the longest strike at the CSO since 1991. What has changed since then in terms of working conditions? Have there been changes in the Chicago Federation of Musicians over the time you’ve been a member? In 1991 we were forced to go on strike over a management demand to reduce our health care benefits. Yes, there have been many changes in officers, but the unwavering support of our union has been constant. I’ve been part of the union since I was twenty, but only recently have I become interested in unions, and not particularly my own musicians’ union, which is embarrassing. I’ve had more of an interest in the history of strikes and particularly in industrial unions. It’s time for me to study the history of the union I am in. On the picket line, I’ve seen other members of the Chicago Federation of Musician, as well as representatives of unions like the Chicago Teachers Union and the Laborers and others in the building trades. Many people might think of a CSO musician and construction workers as occupying different worlds. To what extent do professional musicians see themselves as part of a broader working class, and a broader labor movement? Are there discussions about things like the recent wave of teachers’ strikes? Yes, we are gratified and indebted to our brothers and sisters in other trade unions. Their visible support means so much to us. We are all members of the AFL-CIO, and we are all working-class humans who deserve fair compensation and safe working conditions. I often say I live under a rock. I don’t listen to much news because of my life as a father, husband, and a musician. However, I feel that in any kind of labor — whether it be teaching, the automotive industry, woodworking, or labor in making music — it is imperative that the people who hire understand the work, and the surrounding obstacles to do the work. To understand and be empathetic of the work another does — that’s where a contract talk can start having progress. Though some musicians have a keen consciousness that they are part of the working class and the labor movement, those musicians are in the minority. Higher education and music schools do not educate musicians to have historical consciousness of class strife, labor movements, economic history, or much more. Most of music education is steeped in music history, which can be quite divorced from the bigger context. That needs to change. I have proposed to some local music departments to teach a class on labor unions. Deans I have been in contact with have responded by saying they have entrepreneurship classes, which misses the point. I feel fortunate because I studied ancient history which in which class language and conflict is quite overt — there is no disguising what is going on. However, in the arts, ideas of pleasure, leisure, prestige: all this muddles the real issues at hand. At a press conference in support of the striking musicians, CSO director Riccardo Muti referred to the orchestra as a “temple of culture” and the musicians as cultural ambassadors to the world. As a classical musician, how do you see your role in society? Maestro Muti is correct. What we do is not merely entertainment, it is enriching the lives of Chicagoans and people around the world with our art and culture. Orchestras are very unique, in that all are multicultural. The public may not see this, but we are also multidisciplinary within a single instrument. Multidisciplinary means that a student becomes a pupil of a widely known pedagogue. This is important because one pedagogue has many pupils who become players in orchestras. When one enters a new orchestra, their music making becomes a part of that orchestra’s tradition, but little by little brings in their own unique personality. A player’s playing affects those around them. In effect, we influence one another. We don’t have so called “Russian school” or “Franco-Belgian school” of string playing anymore; it’s a hodgepodge of styles. CSO is known for its sound worldwide. I humbly step into the shoes of those who came before me to continue the orchestra’s tradition. If I do what is expected of me, I feel greatly honored to have done my duty. If I give a little extra something and it is accepted, I’ll be over the moon. I often wonder who we are, as artists and musicians. How are we part of society? Why are we so marginal? What function do we have? What does it mean to have an aesthetic and intellectual space in society? Is the form of labor, that of concert culture for musicians, actually the form of labor we should be engaging in? Is concert culture a just activity for musicians? How else can musicians be engaged within society? I personally do not separate “low” and “high” forms of culture. I do not believe in such divisions. One of the very few employment options that classical musicians have is to play in an orchestra, which is dependent on corporate sponsorship and ticket sales, which only allow for a sliver of the population to attend. Where the money comes from also dictates what kind of programming takes place and also who would be interested in such narrow programming. We work and labor as artists, but we do not produce material goods. Being a musician is part of being an intellectual, but we are not part of the managerial class of the cycle of economic production. We are neither the managers or owners of capital, nor the workers in the factories, nor the precariat. We do not easily fit into the capitalistic system. And this is a good thing. The best things in life — education, medical care, love, nurturance —also do not fit neatly into economic life. I am interested in music for its beauty and for the sublime, but also as a form of survival and a form of struggle. I spoke to several orchestral musicians from the Civic Orchestra of Chicago who took part in a project called “Purpose Over Pain,” a support group of mothers in Chicago who had lost their children to gun violence. The musicians created songs to express the experience and emotions the mothers held inside, and they orchestrated it for mixed ensemble. In their newly found collective, the musicians asked themselves, how do they want to be musicians? Who is their audience? How do they want to interact with their audience? I have heard these questions from many musicians, and I want to make these questions public and insistent. We need to change our world and the way we work, because it neither benefits us, nor society, to be locked into the bounds of concert culture. One of the keenly expressed desires by this collective is that they wish to intimately interact with a wide variety of people and not necessarily as audience members. Musicians are interested in nurturing others. Musicians want to be with people who have a musical need. We want to be part of social change, we want to be part of the conversation and action in creating a just society. John Bruce Yeh has played clarinet for forty-two years in the CSO and is Assistant Principal Clarinet and Solo E-flat Clarinet. He was the Acting Principal Clarinet from 2008 to 2011 for the CSO. Youming Chen plays viola in the Chicago Symphony Orchestra, which she joined in 2015. Isaac Silver is a member of the Chicago Democratic Socialists of America.